It’s impossible to enjoy Castle Crashers without thinking back to the days of yore when red warrior and yellow wizard stood side-by-side in a desperate struggle against legions of undead. I’m speaking, of course, of Atari’s classic dungeon crawler Gauntlet, the four player arcade hit which helped pave the way for the hack and slash genre today. In today’s gaming landscape, where to be retro is to be cool again, the party-centric gameplay of the Gauntlet series is one that certainly deserves revisiting. Now, that’s not to say that the Behemoth’s latest 2D foray is a direct sequel so much as it is an homage; a game which takes all the aspects that made the Gauntlet series great and updates them with today’s technological advances. The end result is a fast paced, kick-you-in-the-mouth experience that’s easy enough for you and a group of friends to hop into, while also offering some collection and RPG elements for that added replayability factor. Armed with a sword, shield, and some magic spells, the four castle crashers are each tasked with searching far and wide for an evil wizard and four kidnapped princesses. Along the way an eclectic cast of enemies will attempt to stop them - ranging from the simple thief, to a troop of light saber wielding dark knights, all the way up to a giant cat crossed with a shark. If you haven’t guessed it already, everything you encounter here really sports its own flavor of twisted humor; I mean, in how many games are you able to fight off a giant cat/shark that has a little white bear for a jockey? That’s what I thought. And as the host of villains you face increases, so to does your personal arsenal. Starting out, you’ll have nothing more than the basic light and heavy attacks, but before you know it you’ll be discovering new combos, advanced spells, and a few useful items to give you that edge: An edge which you’ll desperately need if you’re only going into this title alone or with a friend, as this game gets just downright brutal at times. If you manage to round up two other friends for co-op play, however, it’ll be smooth sailing. Another way to give your characters an extra boost is to hunt down a few of those collectibles. In particular, new weapons and animal companions will each bring their own little stat tweaks, useful abilities, or sometimes both. Perhaps in your travels you’ll stumble across a giant meat tenderizer that gives you a boost to your strength, or a tiny owl companion who will search out food for your character. And also realize that almost every minion you fight can also be unlocked as a playable character, further driving home that collect-a-thon mentality. In the Xbox Live Arcade marketplace there once existed a sizable gap in the shape of a fun, group-oriented action title that you and your friends could all hop into and enjoy together. 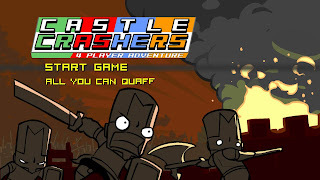 Sure we had our Ninja Turtles and even our Gauntlets, but The Behemoth has succeeded in providing us with a fresh new take on the genre and therefore deserves a hardy “kudos.” Castle Crashers is a fantastic title worth every cent of your 800 space bucks and is a triumphant “bang” to finish off this Summer of Arcade!